I’ve posted before about Danburite and how it’s been an important tool for us when getting psychically attacked. Once again Stevo and I have found that we need to wear Danburite 24/7 to fend off attacks. In addition, I’m wearing Amethyst Cacoxenite and a Herkimer Diamond on the same chain with the Danburite. It’s a bit of a weighty mix, but I’ve found a lot of relief with this combination. It’s also come in very handy as a pendulum. Herkimer is really good at clearing your space so you get an accurate reading. This particular Herkimer was a gift from Carol so it has even more significance. The Danburite (with a spot of Pink Tourmaline) was a gift from Stevo, so I’m wearing gifts from the two people who love me best and that makes the energy so much stronger. The big pendant is Amethyst Cacoxenite, which Carol has recently started carrying on her site. It has a chunk of Citrine with it (clears all other stones), White Topaz and another stone I don’t recall. This was a special find from the 2017 Tucson gem shows. Cacoxenite is a very high vibration stone and it also helps regenerate the physical body. Carol is going to be blogging about it on her site soon. I’ve found that there isn’t any one thing to do when getting energetically attacked. Everything becomes important; grounding, breathing, being careful what you think, what you eat, how you act, clearing your living space, etc. Gemstones are simply one tool in the toolbox but they are an important tool for me. They are friends, colleagues and helpers. Thank you Goddess! I haven’t posted in a while (oops!) because things have been kind of intense in our house lately. With the wonderful help of my weekly chat group, we figured out that all of us in the chat have been assaulted with an etheric “goo” (different from the goo associated with implants) that has really interfered with our lives, businesses and happiness. We first noticed the goo on Stevo last year, and it was a clear film that was covering his aura and making it impossible for him to sleep. We neglected to check him for goo for quite a while, but when we did so this summer, the clear goo was back. I think they made it clear so that it was harder for us to see in his aura. We realized we would have to check for this goo frequently on Stevo to get him back to a normal sleep pattern and get his etheric and physical strength back to 100%. Suddenly, the goo started appearing on all the chatters. And it appeared as a black goo, not clear. To me this black energy felt like black magic. The original clear goo came from the insect race, and the black goo seemed to be from the Triad hierarchy. These two groups are the main ones assaulting the chatters right now. They have even attacked some of the EW posters as well. I have advised everyone being attacked with goo to wear danburite on their body at all times. Stevo and I have noticed that if he takes the danburite off even for a few minutes the goo starts to come back. As soon as he puts it on the goo starts to dissipate. We are both wearing gold danburite, but white or pink will work too. 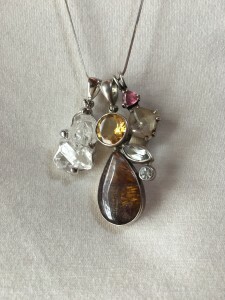 Carol has a few danburite pendants on her site at www.crystalinsights.net and she has access to more. Or you can check eBay or other crystal sites on the internet. I also have a lovely pendant of white danburite and pink tourmaline that Stevo bought for me many years ago, and I routinely wear that when I have to go out in the big, wide world. We really do rely on our crystal friends for a lot of etheric help, especially our golden lemurians (also available on Carol’s site). You can’t just buy a crystal and think everything is okay, though. You have to work with the crystal, talk to it and ask it for help. You have to take an active part in your protection and recovery. I think people sometimes forget that. The Something Big that I last posted about hasn’t happened yet, and I still don’t know what it is, but more and more folks have told me that they feel it too, even PJ folks. As usual, my advice is to ground, and breathe…and get some danburite! Carol and I were at a rock and gem show in a little town in Washington state a few weeks ago, and we came across Green Selenite, which I had never heard of. Apparently, it comes from one location in Australia, near a copper mine that leached into a selenite deposit and changed it’s color. So it’s not strictly natural, but it sure is beautiful. It comes in the green and white combo pictured here, and also a solid green color, with the distinctive shape of selenite crystals. “Green Selenite has a lovely friendly vibration…that will help anyone who wants to be able to make friends with others. It is also a stone that will help you to make choices, and to adapt to change. These green crystals vibrate within all of the chakras from the heart chakra up, but their main action is within the heart chakra and thymus chakra. They have a vibration that is very similar to White Selenite…but the addition of the copper to these stones makes the Green Selenite crystals have some different metaphysical properties. It is a lovely stone to aid you to create a sense of community. They have a strong energy within the heart chakra… and the higher heart chakra… that encourages compassion and forgiveness. Green Selenite is said to bring harmony between people after rifts have caused them to become parted. It helps you to feel good about yourself and aids you to always work towards the highest good of yourself, and others. I like the fact that this crystal works on the higher heart (thymus) chakra. We need more compassion and forgiveness in the world, and the higher heart chakra (located between the 4th and 5th chakras) is the unconditional love chakra. If you ever come across Green Selenite, buy yourself a chunk! I haven’t been much of a dowser in the past because I found that I didn’t get reliable answers. However, lately I’ve been dowsing more and more with a pendulum that Carol gave me as a gift. It’s a triangle with a crystal hanging down in the middle and the seven body chakra colors in crystals above. I’ve found that my dowsing has been more accurate with this pendulum. Now, Carol has found another pendulum, pictured at right, by the same folks who make the triangle pendulum. This one is a merkaba shape (two interlocking tetrahedrons) with stones at each point. My stones happen to be rose quartz, and this was a gift from Carol’s daughter. I really like the energy of this pendulum and Carol is using one with hematite at the points and says it the most accurate pendulum she’s ever used. She’ll be selling these soon on her website with a selection of different stones to choose from. I don’t think I’d ever make a major life decision based on a pendulum swing, but I have found that if I hold my Lapis and Herkimer diamond in my left hand, or an SP, and use my right hand to dowse the pendulum, I tend to get clearer answers. Dowsing is more successful the clearer you are, the more grounded you are; really, the more neutral you are. This rose quartz pendulum helps me stay focused on my heart while I’m dowsing, so I think that helps a lot. I think these are going to be fairly inexpensive…look for them soon on Carol’s site at www.crystalinsights.net. Last year Stevo and I went to Quartzsite, Arizona with Carol and visited all the gem shows. Carol had found a guy selling Golden Lemurian clusters, and we bought one, which I posted about. This year, Carol and I found a ton of Golden Lemurian wands in Tucson, and I bought four big ones for Stevo and I to use. I really just started using mine recently and am amazed at how strong the energy is. I’ve used one of mine a couple of times in my coaching work to heal chakras, but just recently I picked up the one in this picture and used it in a group chat. The energy was simply amazing. Everything happens more quickly when you are using a Golden Lemurian, whether you are doing energy healing, physical healing or just boosting in general. The wand pictured here is one I got for Stevo, thinking it was a twin, but it has two more tiny points on one side, so it’s actually a double twiin. Holding it in my hand is like holding the heart of a very special being. It’s hard to explain. The Goldens are also called Golden Healers and Radiant Hearts, but they do have the lines and ridges on them like the regular Lemurians, and they have the high pitched sound when you clink another crystal against them. Carol picked up a bunch of Goldens to sell and you will find them on her site at www.crystalinsights.net on the Caro’s Choice page. She also got a few personal pieces, one of which has a perfectly symmetrical point, which I now know (see previous post) is a generator crystal, which uses the Earth’s energy to recharge, and will also broadcast energy through the Earth’s energy field (or aura). I realized the other day that one of my golden wands is also a generator crystal, but with a slightly imperfect tip. However, this is the wand I have instinctively used in my coaching sessions and it works really well. Carol picked hers up in our group chat the other day and we all boosted through it with, you guessed it, amazing results! I think the Golden Lemurians are not too well known by most people but they have a very big presence and these large wands almost feel like you have a good friend visiting your house. If you can get one I highly recommend it. I don’t think there are too many of them around and the prices Carol is charging are really fair. Clear quartz is probably the most common crystal out there and people tend to forget how powerful it is in pursuit of the more rare and colorful stones. I have read several things lately about clear quartz that reminded me that clear quartz has so many qualities that people are looking for in a crystal, especially the multi-dimensional quality. According to my stone guru, Robert Simmons, it’s main properties are energy amplification (including it’s ability to transform mechanical energy into electromagnetic energy), programmability and memory. It’s a high consciousness stone, which is why I included it in my Higher Consciousness bracelet, and it’s also a stone of healing. Indigenous cultures all over the world have used it for healing and in religious ceremonies. Robert also says that clear quartz can be used for “almost any metaphysical purpose,” due to it’s ability to be programmed. Programming is nothing more than focusing on the crystal and asking it to help you reach a desired goal, whether that is prosperity, abundance, healing, etc. The more often you focus on that crystal and ask for what you want, the more quickly you will see your wishes manifest in 3D. In my opinion, manifestation is simply putting enough energy on a thought to bring it from the etheric into the physcial matrix of 3D. There’s all this energy floating around out there and it takes focus to coalesce a thought into matter. Like Peter Gabriel said in a song “all of the buildings and all of the cars were once just a dream in somebody’s head.” That’s how manifesting works. Clear quartz just amplifies whatever you focus on. It is a stone of Light and it is also a stone of the Atlanteans. Once when we were chatting with Carol and Don, Carol asked if we had a clear quartz piece to use during the chat so I grabbed a lovely polished point that Stevo had bought a long time ago. I immediately perceived an old man standing near me and when I told Carol that, she said it was an Atlantean guide helping me. Laser Wand – long, tapered, with fine terminations that focus energy like a beam for healing. Generator – six equal sides forming a perfect point (see Carol’s Golden Lemurian Generator at www.crystalinsights.net/collection.html at the bottom of the page), it’s an Earth energy battery, using the energy of the Earth’s aura, and you can use it to recharge your body’s “battery”. Tabular – flat, broad sides, they act as a bridge of light and are good for healing, especially the meridian and chakra systems. Double-terminated – comes to a point at each end, energy can flow in both directions, so can bridge blockages or gaps in your energy system, and can bring high consciousness energy in while grounding negative energy out. Self-healed – one end is broken and has healed over with a growth of quartz crystal, good for healing work. Raised and Sunken Record Keepers – have raised or sunken triangles on the main termination faces, raised record keepers let you access information within your body, sunken record keepers store information in the stone (mostly Atlantean). Dow – one of the faces of the termination point is like a large “window” (see Carol’s personal collection Golden Lemurian dow), it’s a “sign of impending transformation and a quantum leap in consciousness and compassion”. Portal – a seventh face on the termination that is shaped like a parallelogram, can be used to access other dimensions, times and realms of existence, activates the left or right side of the brain. There are other quartz crystals outlined in the book but some of them are just too newagey sounding for me, but feel free to read up on your own. The point here is that there are so many things you can do with clear quartz, and it should be a big part of your crystal “toolbox”. I have numerous pieces of clear quartz, including a clear quartz dodec (small) that I picked up at a rock show. Have fun exploring this wonderful stone! Do you have a travel crystal? Before I was really into crystals a friend of mine who is a rockhound lent us her “travel crystal,” just a nice piece of clear, polished quartz that had been all over the world in a special silk pouch and had really good travel juju. We took it with us to Australia in 2000 and I almost lost it but managed to find it again. We picked out our own travel crystal and let it sit in the bag with our friends’ crystal to soak up some of the travel juju. Once I was flying to California from Montana for a family emergency and I had to go through Salt Lake City, which is an awful airport (or at least it was then) and it was winter so the flight schedule was iffy. I was really worried about whether or not my connecting flight would even take off. I was sitting in the airport holding my travel crystal and basically just asking for it to get me on the plane. Our flight had already been delayed once and they had just announced that it would be a while before they knew the status of the flight. So there I was, rubbing my crystal and talking to it, probably looking like a flake, when all of sudden the flight was announced and boarding began! That was the clearest incident for me of the travel crystal working. I generally leave it in the car since most of our travel is driving and then I carry other crystals with me when I fly. I think it’s a good idea to have one dedicated to travel. Pick one that you love and that has special energy for you. It doesn’t have to be quartz, but it can be whatever feels right to you. That’s what my work colleagues used to call me when I worked at Apple….don’t ask my why! But it seems appropriate to my life now. We visited Don and Carol over the weekend and Carol and I went to a bead show and went a little bit crazy buying beads. I ended up buying as much there as I bought at Quartzsite. The cool thing about that is I got a lot of new kinds of stones and I’m on the way to making a bunch of new bracelets and extending the product line. It’s so fun! In fact, I couldn’t sleep last night for thinking about beads and bracelets…. The other cool thing that happened is that we played around with Carol’s new aura camera, which hooks up to a computer and gives you a real-time image of your aura. I’ve never seen one in person before and it was really fascinating. We ended up testing my bracelets and Carol’s HP to see how they changed a person’s aura and it was very easy to see the effects of both. Carol has generously offered to do some video recordings of how some of my different bracelets change the aura, and I’ll be able to post those on my website in the near future. I think it will really help people to understand how the human energy system works, and how orgonite and gemstones help the energy system. Carol also gave me a Cards of Destiny book so I can do readings on folks I coach and those who order bracelets. It’s a fascinating system with a bit of a learning curve but I’m looking forward to doing readings. If you’re thinking about buying a bracelet and want a reading, just email me and include your birthdate. Stay tuned for more bracelets! These are the crystals I use regularly while coaching folks. I use the lapis sphere and the Herkimer diamond for clearing and psychic vision. Herkimer also increases the energy of all other stones. As I’m working on someone’s chakras, I pick up a stone appropriate for that chakra. I use carnelian for first and second chakras, yellow quartz for the third chakra, peridot and pink tourmaline for the 4th and unconditional love (4-1/2) chakras, aquamarine for the 5th chakra, sodalite for the 6th chakra and a cool amethyst dodec for the 7th chakra. I also have celestite for checking the aura, danburite for removing entities, ametrine for cutting cords, bloodstone for healing and a lemurian for extra oomph. That cool-looking green device in the back of the pic is a Cesco invention that works great for healing. Here are some of my other helpers…Stevo and I have several caches of stones scattered around the house that we can pick up any time we need a little help. Sometimes I will make a pile of stones on top of a Post-It note that has someone’s name on it…kind of a crude radionics effect for helping someone who is being particularly hassled. It seems to help, based on the feedback I get. Many times I have picked a stone that turns out to be that person’s favorite stone. I’ve gotten so used to communicating with the stones that I don’t even really think about it anymore. I just reach for the stone that seems to be the right one. I do have several spheres, a couple of eggs and two dodecs, but most of my stones are rough pieces or small tumbled pieces. They don’t have to be big and expensive to work. I’m still learning a lot about crystals and what each one does…I’m sure I’ll be learning the rest of my life. I encourage the people I coach to get stones and work with them, too. This weekend I’ll be at a bead show with Carol to pick up stuff I couldn’t find at Quartzsite. I have to make sure I take my grounding bracelet to deal with the energy of a lot of gemstones in one place! Can’t wait…. It’s always amazing to me how one minute it’s December, and the next minute it’s the start of the new year. We spent this transition time with our good friends Don and Carol, who drove over to visit. I cooked a ton of food and we ate so many appetizers we never got to the main course! It was great to spend time with Don and Carol and just get a chance to catch up. The pumpkin pie was great too! Carol had some new Mary Magdalene oracle cards and she did readings for both Stevo and I. As usual, her readings were spot-on and reflected so much of what is going on for both of us right now. The Mary Magadalene cards are beautiful as well as functional. I also showed Carol a book I got on Amazon called “Healing Stones for the Vital Organs,” and we started talking about my bracelet business and how I could incorporate the stones associated with the organs into the bracelets I make. I proceeded to whip out eight bracelets in the next few hours! I was totally inspired by Carol’s reading and Don’s belief that I can develop a booming bracelet business this year. With improved health and inspiration from friends and Stevo, I believe this can be a real growth year for me. I have put up several new bracelets in the Using Crystals section of my forum as well as the eight bracelets for supporting the energy of the organs, so check it out. The challenge of the bracelet biz is that most people want to use credit cards to have an immediate sale, and I refuse to use Paypal. Several orgonite vendors have had money stolen from their bank accounts by Paypal. But, I figure if someone really needs a bracelet, they’ll take the time to get a money order from the post office or simply pop some cash in the mail. I’ve had lots of folks send me cash wrapped in foil, even from overseas, with no problems. We’re off to Quartzsite in less than two weeks to stock up on beads so I’ll be ready for a good flow of business energy. I hope to be able to offer some post-Quartzsite coaching/bracelet combo specials, so stay tuned. It’s a lot of fun at Quartzsite, although a bit overwhelming to be around the very high energy of a lot of crystals in one place. Last time we went, I had to wear a grounding bracelet the whole time so I could focus. 2010 was a difficult year for us, and we’re looking forward to a bit of an energetic breather in 2011. Life is always a challenge, though, and we are lucky to have our orgonite friends to support us.